Sponsored Content vs. 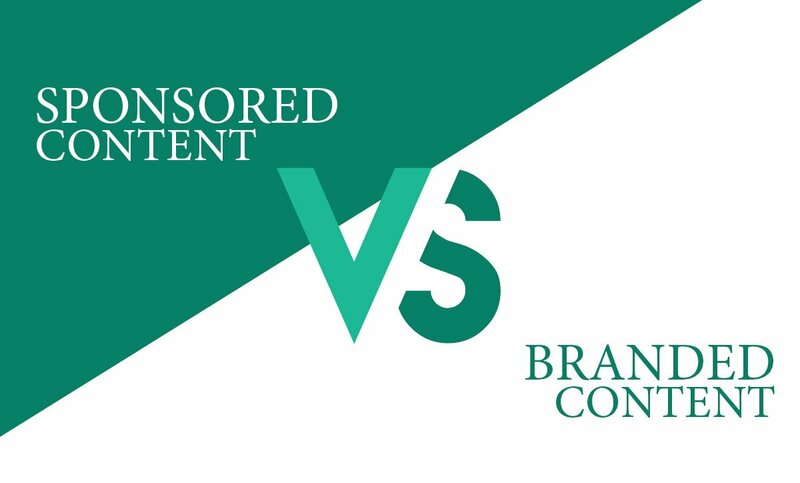 Branded Content: What's the Difference? Sponsored Content vs. Branded Content – They’re the Same, Right? Despite common misconceptions, sponsored content and branded content are not interchangeable terms. Each marketing tool produces different results and has defining characteristics—namely, who the content is produced by and where the content is published. While both forms of content can be valuable additions to your content marketing strategy, understanding the following five differences between the two will allow you to pinpoint which form best caters to your needs. Sponsored content takes the shape of its environment, whether that be a newspaper, magazine, video, blog or social media platform. For example, The New York Timespublishes sponsored content that is structured and written with the same standard of sophistication as a regular news feature and is placed alongside traditional reporting. Shoe retailer Cole Haan sponsored an impressive multimedia article about dancers in the New York City Ballet, which tied the brand to an unforgettable story of tenacious grace and artistic mastery. On the contrary, branded content is ingrained into the company’s website on a content hub such as a blog or news section. In other words, the brand is its own publisher. Sponsored content is a collaborative effort between the brand and the publisher. Together, they create a piece that favorably positions the brand while remaining consistent to the publisher’s tone and style. When expertly executed, the audience will be inherently interested in the content and subtlety become more aware of the brand. A notable instance of well-executed sponsored content is Mercedes-Benz Canada’s partnership with Instagram influencer Roxanna Froese to promote the GLS SUV. The sponsored posts depict Froese’s family adventures and include captions that tell the story of an enchanting road trip taken in the GLS SUV. Because the post does not stray from the publisher’s typical narrative, viewers are more likely to linger on it rather than quickly pass over it like a traditional advertisement. An in-house content team or agency partner typically creates branded content. This method eliminates the chance of a brand’s voice getting confused with an external collaborator. FedEx’s Instagram account includes stunning photos of the places its trucks and airplanes travel through. Because the featured photos are artistic and intriguing while refraining from being strictly promotional, the account feeds its followers’ wanderlust while providing a subtle reminder that FedEx delivers wherever they may travel. The real value of sponsored content lies in its potential to make an authentic connection with a new audience. Partnering with an influential publisher lowers the barriers to capturing consumers’ attention because the content is delivered to them from a trusted source and isn’t packaged to look like an advertisement. Instead, the content aims to appeal to their interests and give them something meaningful, such as knowledge or a moment of entertainment. Because of sponsored content’s power to recruit new leads, it is critical to select a partner with a follower base likely to be receptive to your brand’s message. Branded content has a shorter reach. It can resonate with people who are already poking around a company’s website or following a brand on social media, but harnessing the attention of a large new audience is unlikely. The costs associated with content marketing will vary depending on the campaign and medium. Working with a partner to create mutually beneficial sponsored content is generally more expensive and more time consuming than self-publishing branded content. This is because branded content can be produced by your existing marketing team and published on your own website and social media pages without additional expenses. When working with another publisher, more time must be spent coordinating details to ensure a successful transfusion of both voices, whereas working alone allows for increased autonomy and consistency of messaging. Furthermore, branded content is more cost-effective in the sense that it can be recirculated later. Sponsored posts tend to be one-time deals. Both forms of content are great tools for your sales funnel. Sponsored content tends to be an effective top-of-funnel strategy because it increases exposure and drives new traffic to your website. Branded content aids the middle of your sales funnel, as it nurtures leads who have already ended up at your website by feeding them resources. When adopted together, sponsored and branded content complement each other—sponsored content directs potential customers to the website where your branded content lives. Of course, execution weighs heavily on the results of any content marketing campaign. There is a delicate balance to crafting a compelling message—if it pushes a sale too much, the customer may feel deceived. But without some sort of sales element, the content is ineffective. Need help injecting sponsored and branded content into your marketing strategy?